Iona's Beach is located 43 miles Northeast of Duluth and just 3 miles north of Gooseberry Falls State Park, along the shore of Lake Superior. The Minnesota Department of Natural Resources has designated area as a Scientific and Natural Area (http://www.dnr.state.mn.us/snas/sna01000/index.html). 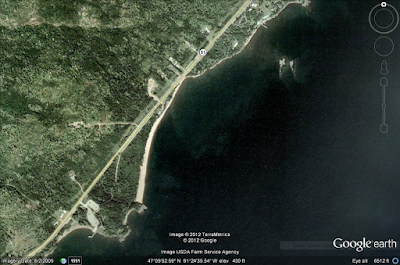 Iona's Beach is near the former site of the Twin Ports Resort and is named after the former owner of the resort, Iona Lind. 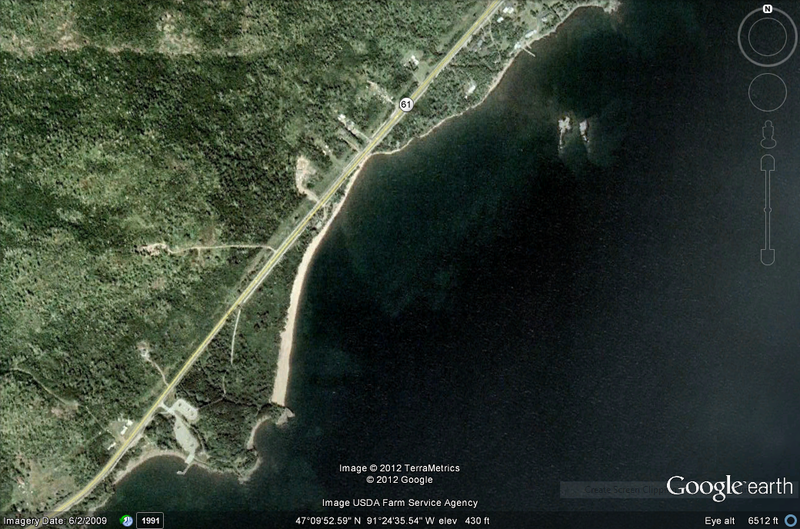 Located adjacent to Minnesota State Highway 61, the rock beach is approximately 300 yards long, as seen in this Google Earth image. 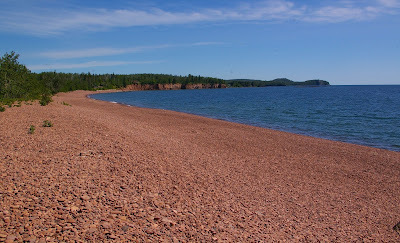 The beach is comprised of flattened pink rhyolite pebbles, also known as shingles. The source area of the rhyolite pebbles is a cliff on the northern edge of the beach. 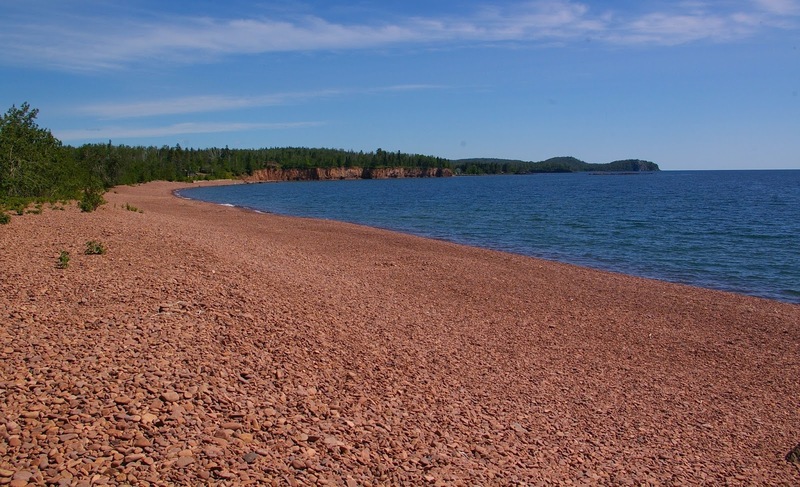 As Lake Superior's waves erode the rhyolite cliff, individual rhyolite shingles are rounded and tranported along the beach. A basalt outcrop portrudes into Lake Superior on the beach's southern edge. This basalt outcrop prevents rhyolite pebbles from moving beyond the area and effectively traps the pebbles in this location. At the northern edge of the beach, the rhyolite cliff is located. The rhyolite lava flow is associated with the 1,100 million year old Midcontinent Rift System as are most of the rocks of this area of the state. The cliff is 20-30 feet above the lake level. The area closest to the rhyolite cliff is comprised of fairly angular pebbles, since these materials have not been transported very far and as such, the amount of time they have been weathered is limited. 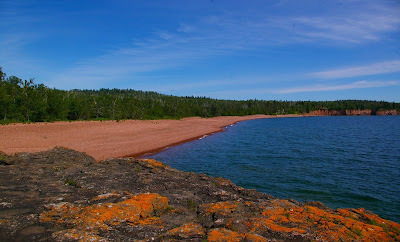 Looking south from the rhyolite cliff, you can see the basaltic point that extends into Lake Superior, effectively trapping the rhyolite pebbles. Closer to the southern edge of the beach, the rhyolite pebbles are much more rounded and smooth, due to the weathering that has occurred as they have traveled from the source area with the assistance of longshore drift in the lake.